I loved the title story of this collection, but the others became increasingly disappointing after the standout experience of "Dictation." As is usually the case, Ozick is, despite herself, a nonfiction essay writer. Her fiction is idea-driven, turning entirely on novel concepts that almost always fail to carry a story to a fulfilling conclusion. When it works, as it does in "Dictation," the result is fabulous, but more often than not I wish I were reading her nonfiction instead. 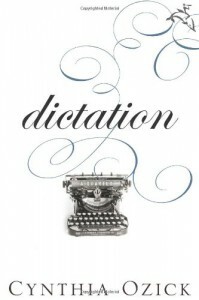 Rather than the whole book, I would recommend "Dictation" as a side to any of the essays in her nonfiction collections.